Within the last few years you may have seen extensive advertising about the benefits of using ripple "v" bristle fields; these uniquely shaped bristles help prevent plaque formation, as they can more effectively get in between the teeth. What you may not know is that Fuchs is one of the original manufacturers of the ripple v bristle toothbrush always at the forefront of dental care technology. Fuchs has marketed this type of brush head worldwide for more than 40 years. 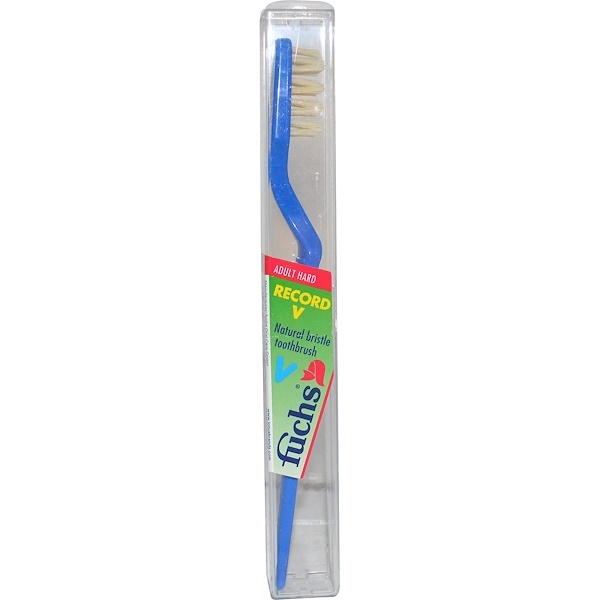 Although billed as a new dental care discovery, ripple v bristles have been a successful part of the Fuchs line since the 1950s! They are still the best-selling bristle shape in the Fuchs product line. At Fuchs, these pioneering ripple "v" bristles toothbrushes are marketed under the name "Record V". You will find them in our product line in both nylon and natural bristles, and in soft, medium and hard levels of stiffness. The Record V Toothbrush also features a uniquely angled neck, providing maximum agility in reaching even the furthest corners of the mouth. These unique brushes also have the distinction of being copied by most of the major US toothbrush manufacturers over the last few years, albeit at much higher prices.